ESPN’s HD said today that ACC fans are going to be missing out this season, in large part to the the absence of Mark Herzlich. Although he won’t physically be in the huddle this season, Mark Herzlich is going to be in the hearts and minds of each and every player, coach, ball boy, and fan in the stadium. Before the first whistle blows, the entire world will look down on that sideline and see #94, ready, and focused on the task at hand…to inspire those men who have stood by his side throughout this entire process. All controversy aside. 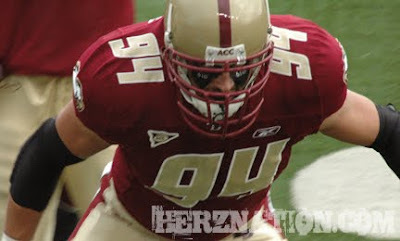 We at HerzNation cannot wait to see what BC can do with the power of Mark Herzlich behind them. Pray ’til it Herz!